With Delaware being close to the ocean, many companies in the state rely on both shipping fleets and marine vessels to bring in new supplies for retailers and consumers. Because diesel engines offer longer lasting durability and greater fuel economy than the gasoline counterparts, many companies are turning to diesel-powered vehicles to transport goods across the country. In order to keep up with the repair and maintenance of these vehicles, companies in Delaware hire certified diesel mechanics to keep the shipping fleets running in optimal condition. For those who are contemplating a career in the mechanic industry, earning a degree in diesel technology provides job stability and increases one’s chances of success in this field of expertise. Every college, vocational, and community school requires some educational prerequisites to be met before students are qualified for enrollment, including earning one’s high school diploma or GED. Even though a few companies still hire diesel mechanics who have several years of work experience in the mechanic industry, more employers now require candidates to have earned a degree in diesel technology because of the ever-changing advancements in repair technology and engine construction. If the demand is high enough, some employers pay for aspiring diesel mechanics to earn a certificate in order to obtain an entry-level position in the company, which can take about one year to complete. For those who wish to ascertain a higher paid position, earning an associate or bachelor’s degree is key to opening up many employment opportunities in Delaware. Individuals who wish to earn an associate or bachelor’s degree in diesel technology need to attend an accredited vocational, community, or technical college, and they need to make sure the program is accredited through the National Automotive Technicians Education Foundation (NATEF). Accreditation is essential to furthering one’s career in the future, allowing diesel mechanics to seek certification in a specific sector of this industry. For those who wish to enter into a management role at a shipping company in Delaware, earning a Bachelor of Science in Diesel Technology offers a well-rounded educational experience that prepares students for managing other diesel technicians and making sound business decisions. Like most states, Delaware does not demand diesel mechanics to obtain a license to work legally in the state, but many companies prefer mechanics to be certified in a specific sector. By earning a certificate in preventative maintenance, brake systems, or fuel systems, diesel mechanics prove they are proficient in one of these areas, resulting in a higher paid position. In order to stay up to date with certification, the ASE requires diesel mechanics to re-certify every five years by taking the exam again, ensuring the mechanics have a full understanding of the latest repair techniques. 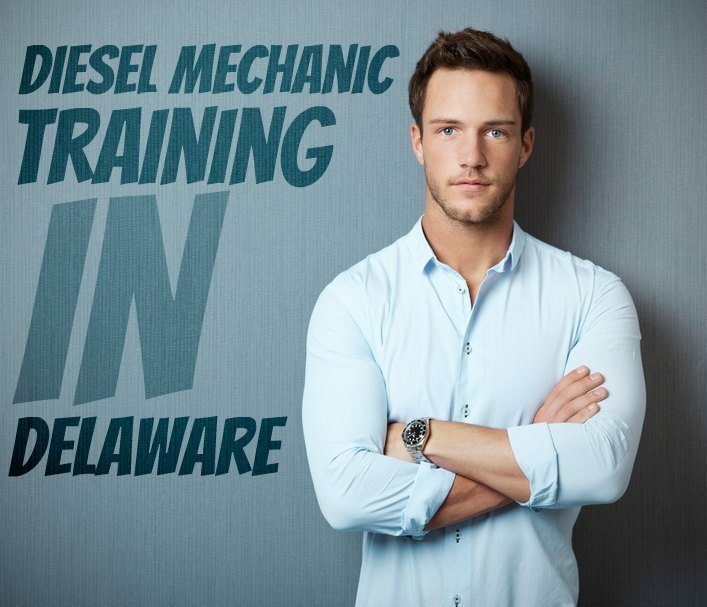 Diesel mechanics can also find positions in different industries across Delaware, depending on the certificates they hold. From working on a marine vessel to repairing avionics equipment, diesel mechanics need to earn their licensure through the industry’s governing organizations, such as the United States Coast Guard (USCG) or the Federal Aviation Administration (FAA). When ascertaining a position as a diesel mechanic in a different industry, individuals may need to enter an apprenticeship program with the company hiring them on. With so many different industries desiring certified diesel mechanics to repair and maintain diesel-powered vehicles, diesel mechanics have a wide range of job opportunities in Delaware. According to a 2012 report issued by the U.S. Bureau of Labor Statistics (BLS), companies in Delaware hire about 390 diesel mechanics, with the employment outlook predicting 21,600 more job opportunities across America by 2022. From shipping marines to local garages, diesel mechanics have numerous career opportunities available to them in Delaware. For those who wish to obtain a higher paid position or career advancement in this field, earning a degree in diesel technology offers job stability and career success.